This single house is all that’s left of a neighborhood in Zhejiang Province, China that was demolished to make room for new urban development. The house, a dwelling owned by redevelopment resister Luo Baogen and his wife, has been completely encircled by a new street that leads to a railway station near the city of Wenling. Households such as this one that stand up to developers are dubbed “nail houses”, as their owners refuse to be “hammered down”. These dramatic images depict a common dispute between officials and homeowners who are offered too little compensation – sometimes less than half their worth – when they are asked to move. According to reports, the government first approached Luo with an offer of $35,000 for the house, which is worth $95,000. The fact the house remains intact and with access to water and electricity is unusual in such disputes – although utilities aren’t expected to continue for much longer. 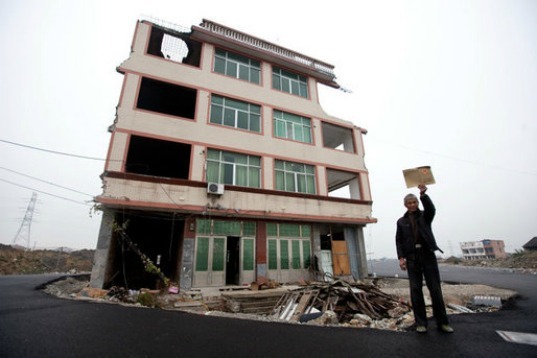 This single house is all that's left of a neighborhood in Zhejiang Province, China that was demolished to make room for new urban development. The house, a dwelling owned by redevelopment resister Luo Baogen and his wife, has been completely encircled by a new street that leads to a railway station near the city of Wenling. Households such as this one that stand up to developers are dubbed "nail houses", as their owners refuse to be "hammered down". 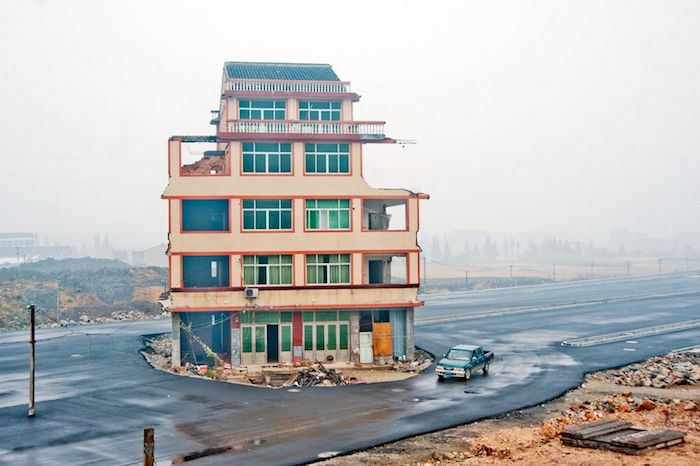 One lone house is all that is left of a neighbourhood in Zhejiang province, China, since it was demolished to make room for a road designed to improve transport links. The house, a dwelling owned by redevelopment resistance Luo Baogen and his wife, is surrounded by the new street connecting a railway station near the city of Wenling. Inhabited by the residents who stand up to the developpers, such homes are dubbed 'nail houses' as their owners refuse to be "hammered down".